Traveling with kids? Without advance planning, it’s easy to wind up eating whenever, wherever, it’s convenient—which likely means some unmemorable meals. Well, what if you had a local NYC food-loving friend to tell you everything to do and eat in one perfect day? Hi, that’s us! 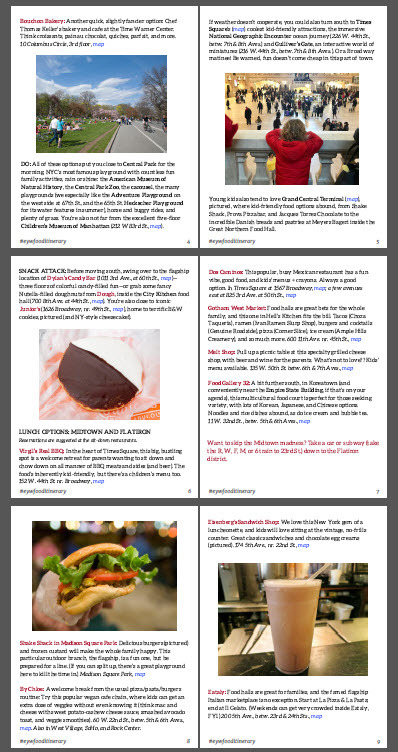 With our new downloadable one-day NYC eating itineraries (and custom multiday itineraries), we can help you out. We at Eat Your World—Laura and Scott—are world travelers with a penchant for guiding others to incredible regional food via this website. However, we also have called various parts of New York City home for nearly 20 years (uh, dating ourselves big-time), and we've made it our business to eat and explore and write our way through it—high end to low end, traditional to trendy. We even offer in-person group food tours in the deliciously diverse neighborhood we live in now. The self-guided daylong itineraries are detailed—our current offerings are 18 pages apiece—but flexible, giving lots of options for meals and snacks and even plenty of suggestions for what to do when you're not eating…plus Google Maps detailing the location of every spot. They’re organized around various themes, beginning with Classic NYC foods—the city’s essential local foods, so kind of our jam—and Kid-Friendly NYC foods, because if you’ve been following along, you know we eat and travel with our two little boys these last five years. And families can use all the help they can get when traveling! Use one itinerary or more than one, follow them by the T or build upon 'em yourself. Each one is a downloadable PDF file—you can preview part of one here—viewable on your smartphone or PC/Mac, purchasable for $9.99 apiece via PayPal (download links are emailed out immediately after your purchase). And as part of our Feed Your World initiative, we’re donating a dollar of every single purchase to a nonprofit fighting hunger around the globe, starting with Feeding America. Custom multiday itineraries are also available! If you want help planning a three- to five-day eating itinerary, shoot us an email at [email protected] and we will send back a series of questions to get to know you and what you’re looking for. This service costs just $25 per day of your trip, no matter how many people you’re traveling with. Look, we love in-person food tours; we offer them ourselves! But there’s something about having the detailed insider information in hand to use as you wish, at your own pace—for a fraction of the price. We're so confident you'll love our one-day itineraries that we are offering a no-risk guarantee: If you're really unhappy with your purchase and can prove via photos that you actually used it, we'll give you a full refund. So far we have self-guided classic NYC and kid-friendly eating guides, but we already have more in the works. Next up: Vegetarian NYC. Let us know if there’s a themed itinerary you’d like to see!